The devotees visiting Bhavani Sangameswarar and Kodumudi Mahudeswarar temples were told not to enter rivers. The tourists visiting Kodiveri dam were barred from taking bath. ERODE : With release of over 50,500 cusec from the Bavanisagar dam to the Bhavani river on Wednesday, the river flooded for the first time in 17 years. 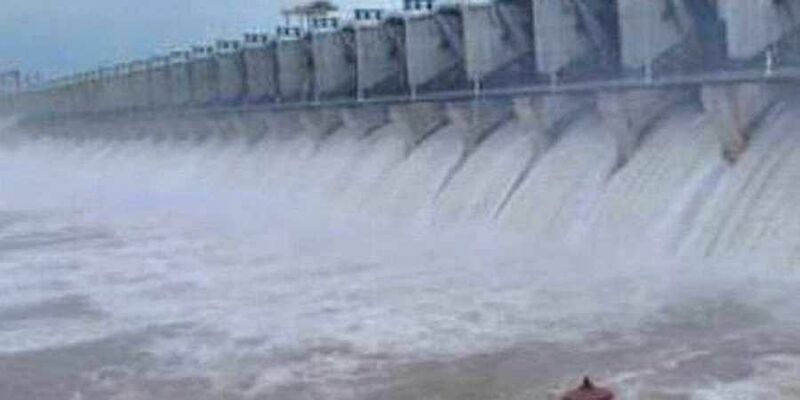 After visiting the flood-hit areas of Bhavani town and Kodiveri dam area near Gobi, Collector S Prabhakar said that water level in the dam had reached full capacity of 120 ft and the entire inflow — 10,000 cusec last night to 43,984 cusec on Wednesday — was being let into in the river. The river would merge with Cauvery at Koodathurai in Bhavani. As 1.5 lakh cusecs was being released into the Cauvery, the water flow after the confluence with the Bhavani could reach up to two lakh cusec. Hence, a flood alert was issued for people living along the banks of the Cauvery and Bhavani and fishermen were barred from entering the rivers to fish. As many as 18 villages were alerted by tom-tom and public address system. People were told not to bathe or wash clothes in the river even as PWD, local body, revenue and police officials were closely monitoring the situation. The devotees visiting Bhavani Sangameswarar and Kodumudi Mahudeswarar temples were told not to enter rivers. The tourists visiting Kodiveri dam were barred from taking bath in it. The PWD officials were camped out at the Bavanisagar dam to monitor the inflow and outflow. The Collector also directed the officials to evacuate the families in low-lying areas to safer places. Accordingly, 45 families at MGR Nagar 52 families of Sithi Vinayagar temple street, over 100 families of Iyyappan temple, Pillaiyarkoil streets, and Fathima Nagar, and 50 families of Thottampalayam, were shifted to safer places in Sathy town. Similar help would be made available to the required families in the district, he added.